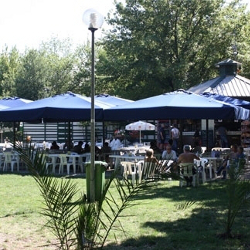 Lido di Casalecchio is a kiosk surrounded by a wide green area, offering outdoors tables and beach umbrellas to shelter from the sun. This is the perfect place where to enjoy a relaxing break having a snack like a sandwich, a typical piadina, a pizza or a salad or to refresh yourself with a cold drink, an aperitif or a cocktail while hanging out with your friends. The area of Casalecchio’s lido has been reopened to the public after an important restoration project carried out in 1998 which managed to rebuild the beach resort that used to stand there.